In the name of science and emotional honesty a full water-bottle inventory was taken. I am okay, sort of, but continue to suffer moments of emotional trauma when reflecting on a) how many water bottles we have; b) the frequency we purchase bottled water and additional water bottles. I used to rant and rave about our persistent purchase and subsequent loss of sippy cups. We had a box of mismatched lids, bottles and valves that kept growing no matter how many we stashed in the car or diaper bag. In smug satisfaction I reported to the world that those days had ended for good. 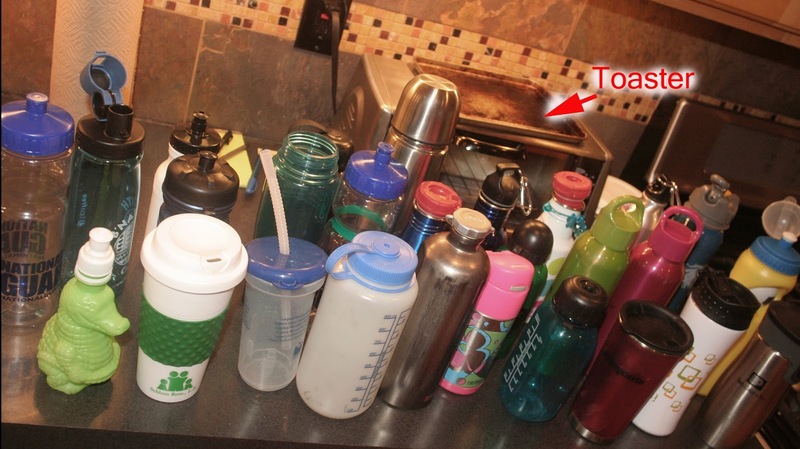 Then came the water-bottle inventory. The only thing that makes this a little easier to bear is that some of the above are insulated cups, which is technically a different category. Now I tell my kids every time a bottle of water is purchased not only does an angel die, but a unicorn is sent to hell, too, just for good measure.